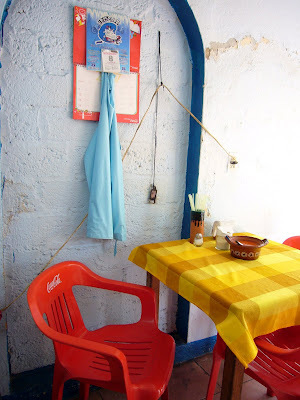 I stumbled upon this place my first morning in Puerto Vallarta. A small restaurant without signage, modestly yet cheerfully decorated, it somehow felt promising before I even stepped inside. Benjo's is owned by Evangilina Madedro, but her daughter Malena is the solid presence here. She does all of the cooking, and always greets her customers with a warm, welcoming smile. And can she cook. This is why I love these little places so much, why I am always seeking them out and returning to them again. It is where one is most likely to find the tastiest, freshest and most authentic food....cooked straight from the heart. Steeped in tradition and pride, yet void of pretention and ego; in my opinion, it is the ultimate in peasant fare. When it comes to most things, I am reluctant to call myself an expert. But when it is regarding huevos rancheros, I know my *%$!?#. During my recent study in the field, the hands down top of the heap was clearly Malena's version. 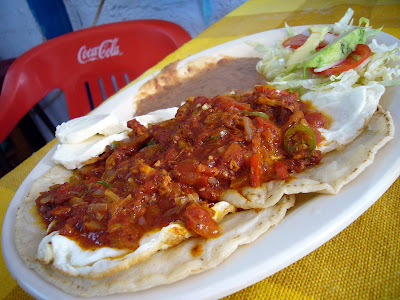 Starting with a layer of soft, fresh corn tortillas, two eggs cooked just enough to still allow their rich, marigold yokes to run thick when pierced with a fork, topped with a rich red tomato sauce (as opposed to the green chili version), and a few slices of fresh, locally made panella cheese....all made for a deliciously memorable meal. Served with tastey refried beans and a small, fresh side salad to provid the ultimate contrast in flavours, colours and textures, I was in rancheros heaven. Click here to see more photos.